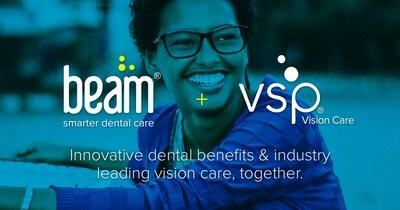 COLUMBUS, Ohio, Oct. 27, 2017 /PRNewswire/ -- Beam Dental, the innovative provider of small and medium-sized business dental benefits, announced a partnership today with VSP Vision Care, the only national not-for-profit vision benefits company, through which Beam Vision will feature a selection of VSP's industry-leading vision benefit plans across 10 states, including California, Texas, Illinois, Arizona, Ohio, Colorado, Washington, Utah, Wisconsin, and Kentucky. Beam Dental, the innovative & tech-forward dental benefits company with a nationwide network. Innovative dental benefits & industry leading vision care, together. Beam Perks – A smart electrict toothbrush, toothpaste, refill heads, and floss, included with every Beam Dental plan, delivered right to your door. Alex Frommeyer, Beam's Co-Founder and CEO, said of the partnership, "As a leader and innovator in the delivery of vision care, VSP is unmatched in its expertise, especially in the markets where Beam Dental is seeing tremendous growth. Our members and the employers we support are just as excited as we are to offer such high-quality vision plans as a bundle with our core dental insurance product line." Beam members who enroll in a VSP Vision Care plan have access to a network of 38,000 eye doctors for their eye care and eyewear needs. Interested brokers and employers based in the aforementioned markets should learn more about how Beam is reimagining dental and vision care, and explore the vision benefits now offered by visiting www.beam.dental. Beam Dental is a dental benefits company that offers employers a fundamentally unique approach to coverage by incorporating dental hygiene behavior into policy pricing. 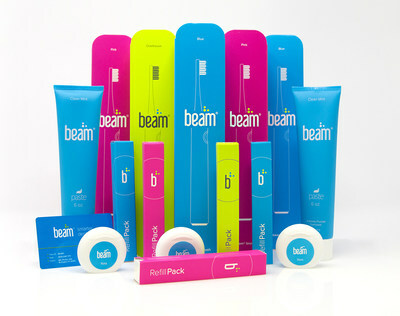 All of Beam's plans also include Perks, a quarterly subscription service with an electric toothbrush, replacements heads, toothpaste, and floss. Beam delivers world class support and service to all members, making easy to find and access dental services with the tap of a finger from a broad, nationwide network of dentists. As a doctor-governed company, VSP Global® exists to create value for members and opportunities for VSP network doctors. VSP Global's complementary businesses include VSP® Vision Care, the only national not-for-profit vision benefits company, which provides access to eye care for its 85 million members through a network of 38,000 member eye doctors; Marchon® Eyewear, Inc., one of the world's largest designers, manufacturers and distributors of high quality eyewear and sunwear; VSP Optics Group, industry leaders in ophthalmic technology and lab services, providing custom lens solutions for the vision and lifestyle needs of patients; Eyefinity®, the eye care industry's largest electronic health records and practice management software company, and VSP Omni-Channel Solutions, which creates connected consumer experiences designed to strengthen the relationship between VSP members and their eye doctors. To date, VSP network doctors have provided eye exams and eyewear at no-cost to over a million people in need through a partnership with VSP Global's Eyes of Hope®. Columbus, OH – Beam Dental, the innovative provider of dental benefits for small- and medium-sized businesses, today announced that it raised a $5.5M Series B. Led by St. Louis-based firm Lewis & Clark Ventures, with participation from Columbus' Drive Capital (which led Beam's $5M Series A in 2014), this significant raise underscores the company's value proposition. As part of the financing, Lewis & Clark Ventures Principal Ron Watson will join Beam's board of directors. "It's rare to see a true disruptor within the benefits space, but Beam is precisely that," said Watson. "We are delighted to add Beam to our portfolio, and view the company's smart, scalable approach to benefits as demonstrative of its staying power." Beam Dental is a dental benefits company that offers employers of all sizes a fundamentally unique approach to dental insurance coverage by incorporating dental hygiene behavior into policy pricing. The more engaged a member is with day-to-day dental hygiene, the better the group premium discount upon policy renewal. Beam's dental insurance policies include Perks, a quarterly subscription service with an electric toothbrush, replacement heads, paste, and floss for every insured member. Alex Frommeyer, Beam's Co-Founder and CEO, said, "We are incredibly excited to partner with Ron and the Lewis & Clark team. Beam is solving a huge problem, offering affordable dental care access to the 100 million Americans who don't have coverage today and having two high-quality, Midwest-focused investors in Lewis & Clark and Drive Capital shows the alignment of our values and goals." The capital will be used to fuel expansion into new markets and allow Beam to continue to provide world class support & service to its members. Beam also recently announced its partnership with VSP to deliver a vision insurance solution to the market as well. The company currently markets its dental and vision insurance products in California, Texas, Illinois, Arizona, Ohio, Colorado, Washington, Utah, Wisconsin, and Kentucky, although Beam's network of dentists is nationwide. Learn more about how Beam is reimagining dental and vision care by visiting www.beam.dental. Lewis & Clark Ventures is a St. Louis-based venture capital firm focusing on high potential investment opportunities throughout the Midwest region. The mission of the fund is to deploy series A / B stage growth capital into companies operating within sectors that include agtech, digital healthcare and software, serving markets such as financial, agricultural, healthcare, and business enterprise solutions. Drive Capital invests in innovative technology, healthcare, and consumer companies in the Midwest. We are looking for innovative entrepreneurs addressing big market opportunities. Our goal is to partner with entrepreneurs that have audacious goals and strive to build large sustainable companies.